L’anse Amour is located near the picturesque Point Amour lighthouse, a provincial historic site and the Maritime Archaic Indian burial site and it is a definite stop for the majority of tourist and locals alike. Often times in early summer & fall this area is used by the local school for a picnic area, the local 50 plus club, church groups and an outing for residents from our local long term care facility. L’Anse Amour offers a beautiful sandy beach where peace and tranquility is at its best. The view of the “Strait of Belle Isle” where often you will see fishing boats, ferry, recreational boats, icebergs, whales, birds etc. is just breath taking from every angle. The ocean breeze will allow sitting, relaxing by the fire and enjoying the serenity all around. The grant from IGA allowed us to purchase signage, do ground work, purchase outdoor furniture & fire pit. We were able to purchase composite furniture that obviously will extend the life of the product in the outdoor and in the off-season we store all the furniture in a storage shed. The space is very visible from the highway and signage is erected acknowledging IGA as funding partner in this great initiative. There is parking space made available so traffic is able to pull off to the highway thus not creating any traffic issues. As we are located near a beautiful sandy beach with brooks running out into the ocean there is a bridge made to cross over the brook that will enable individuals to walk completely along the beach from one end to the other, this encourages physical activity while enjoys clear refreshing air and ocean smell. As this area is also along the local pioneer footpath the local tourism association has erected an historical board pertaining to that information. 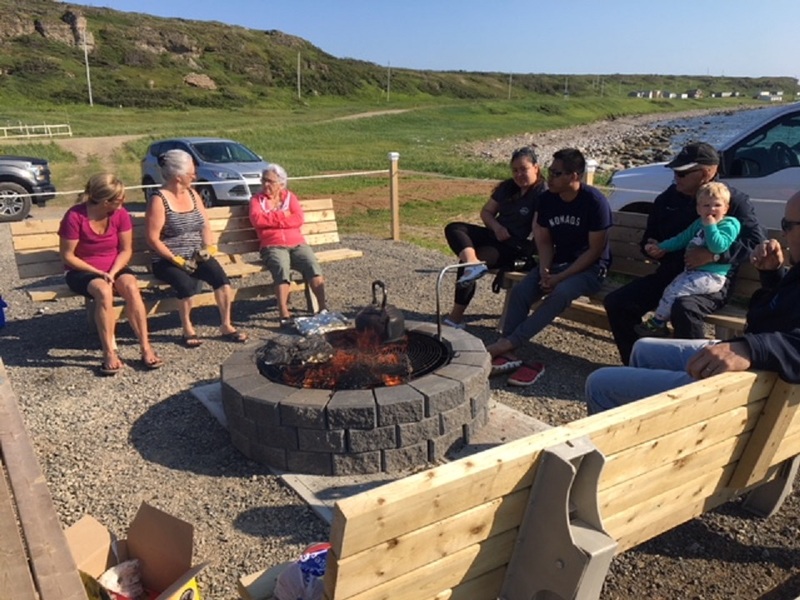 This space is a common area to see tourists and locals alike stopping to enjoy the space for meal time, lighting the fire, relaxing and reading. This space is well utilized and we are very grateful to IGA for their contribution in making this a reality.